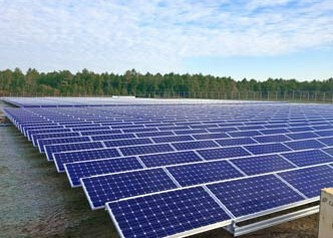 REDP was responsible for the turnkey development of this 900 kW ground mounted solar project in southeastern Massachusetts. The net metered project was constructed on underutilized agricultural land and will offset a portion of the agricultural and commercial electricity needs of the A.D. Makepeace Company, the world’s largest cranberry grower. The project was designed to blend harmoniously with adjacent agricultural practices, and involves the use of a non-penetrating foundation system and fixed tilt modules arrayed over an approximately 4 acre site. REDP secured all project entitlements, including a special permit from the local zoning board and approval from the local conservation commission. REDP also negotiated long term land lease and offtaker agreements with the A.D. Makepeace Company, and arranged EPC services and project financing with a local electrical contractor and development partner. The project is estimated to produce over 1.1 million kilowatt hours of electricity annually, providing the A.D. Makepeace Company with a sustainable and reliable source of renewable energy, and saving the company money compared to retail electricity purchase. In addition, the project helps to avoid the hidden costs associated with traditional electricity generation, including greenhouse gas emissions, resource extraction impacts, and reliance on foreign fuel suppliers.